Yes I have family on the Spain/Portugal border and they tell me it's been unusually hot for weeks already, even by their standards, and the coming week looks like early August rather than mid June with temperatures regularly over 40C. Closer to home, interesting to see the GEFS mean has uppers of 12C or above from this Saturday all the way to next Saturday for the south. 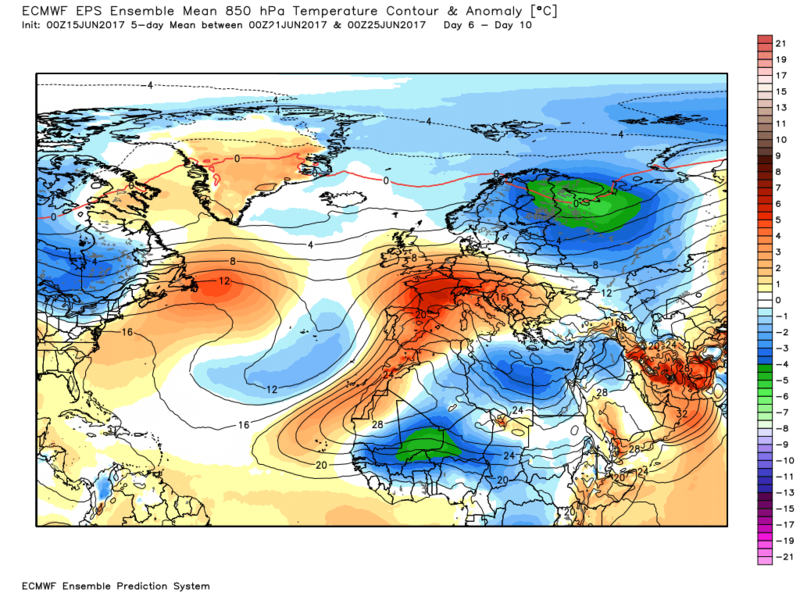 A quite notable heatwave starting to look possible, if the Atlantic fails to breakthrough mid next-week. Several days up to 30C possible in the south. Although varying in detail the ecm is pretty much on the same page as the gfs. At T144 it has also promoted the upper trough west of Iberia resulting in a surface analysis of low pressure to the NW and SW disrupting the ridging north east and pushing the high cell over the UK north east and then east.This is the starof the tricky period previously mentioned. 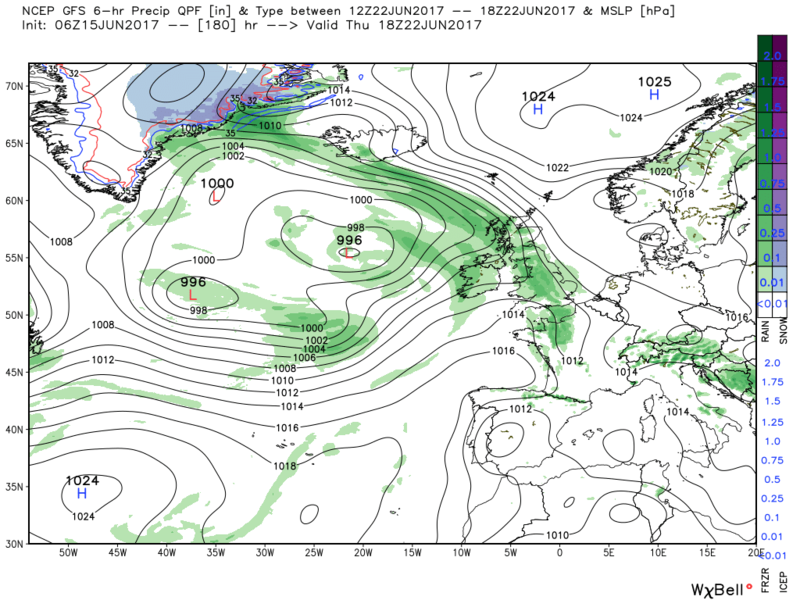 The ecm has the surface low tracking NE bringing inclement weather to Scotland on Thursday Thereafter showery outbreaks, albeit light, as the latter comes under a slack low pressure area. As also mentioned previously this is a long way from being resolved and just a watching brief at the moment. Sunday a similar spread but temps a degree or two higher in the SE region. Monday perhaps the concentration of the higher temps a little further south and west and certainly in the SE 29-30C quite widespread, Thereafter some cooler temps (relatively) but some more WAA on Thursday (29C again) but absolutely no point in looking in detail in this area until the analysis is sorted and the uncertainty resolved. Today we are faced with the very real possibility that the warmth/heat may be very slow to leave, perhaps even lasting late on into next week! Laughably it is predicting 22/23c in places with 15c 850s. Yeah, ok then GFS! A very decent spell of weather on the way. Summer 2017 starting off well! As a matter of interest why is 22/23C in places and 15C 850s necessarily laughable? Continental flow, high 850s, thicknesses >564 dam, no rain, zero CAPE (no instability) and only high cloud....do you really think temps will only reach 23c if that all verifies? Come on! We all know these GFS predicted maxes are usless....in the May hot spell they were consistently 3-5c under the actual maxima. 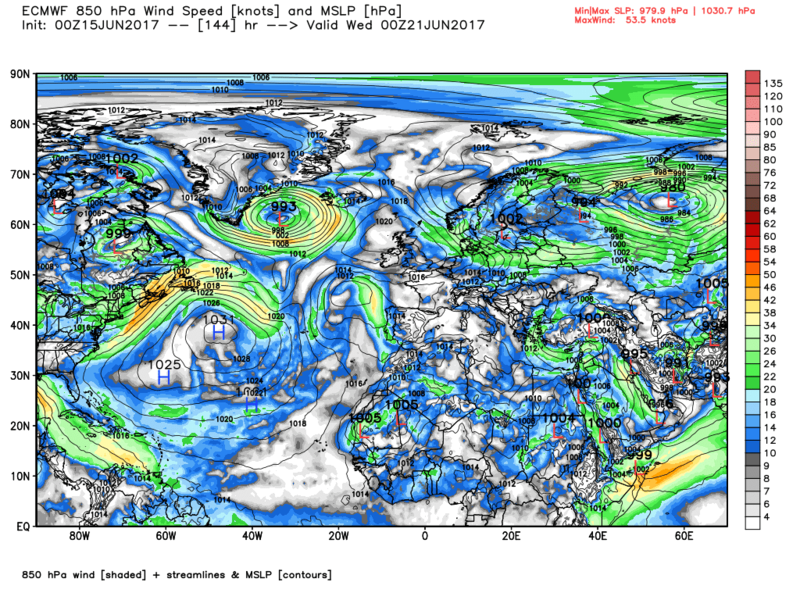 I expect similar here if that verifies. Looking very good indeed for a long very warm settled spell. Don't come on me. I said necessarily wrong, If you can accurately forecast lapse rates 8 days down the line you are a far better man than me. I would go further and say all model predicted max 8 days down the line are useless so why bother making a comment in the first place which requires you to make a stab at the lapse rate when the surface analysis is not even sorted? I wasn't suggesting the gfs was right. Because the south coast yesterday reached 23c in hazy sunshine, a southerly breeze and 8c isotherm. 22-23 degrees with 15c isotherm a week inside the longest day of the year with a hot preceeding weekend would not, absolutely no way generate 22-23c. Would be looking at the very least 25c pushing 30 in places. Today for example, 21 degrees progged in a fresh Westerly airflow in 7 degree upper air temps. Now tell me that if you double that upper air temp, a very warm humid southerly or south Easterly air flow with a preceeding weekend of 30 degree temps would only generate 22 or 23 degrees. Nonsense. I'm sorry but utter laughable. So I'm not allowed to possibly speculate on the possible temperatures in 8 days time, but you are allowed to unequivocally state it will be 29c in 7 days time? What exactly is the difference here?  Stop being so pernickety for the sake of it, and lighten up, it's a model discussion forum! Let's get one thing absolutely clear here. I couldn't give a toss whether you speculate on max temps for Xmas day and I haven't unequivocally stated anything. I merely brought the subject up in the first place because from a meteorological point of view it is not laughable or unreasonable so your comment when read by people without your knowledge could be very misleading. I'm perfectly light thank you but thanks for reminding me this is a model discussion forum. Irony is no longer on the agenda. And back to sensible informative & polite model discussion please. The good news is that the GFS has gradually been pulled into line over the last couple of days, and its consistent backing of the cooler outcome has been pegged back so much that now only 3/20 members go with the idea. The outlook is far from certain into next week, with finer details determining whether it just ends up pleasant, or remains hot. Will we get a thundery breakdown? The ensembles don't really fancy it at the moment, with very little in the way of ppn forecast. The GFS will come round over the next few days on its temp at surface level. Although like others have pointed out, it's crap at getting it right. But it has a habit of this including in winter when it over doea it and they are much lower. 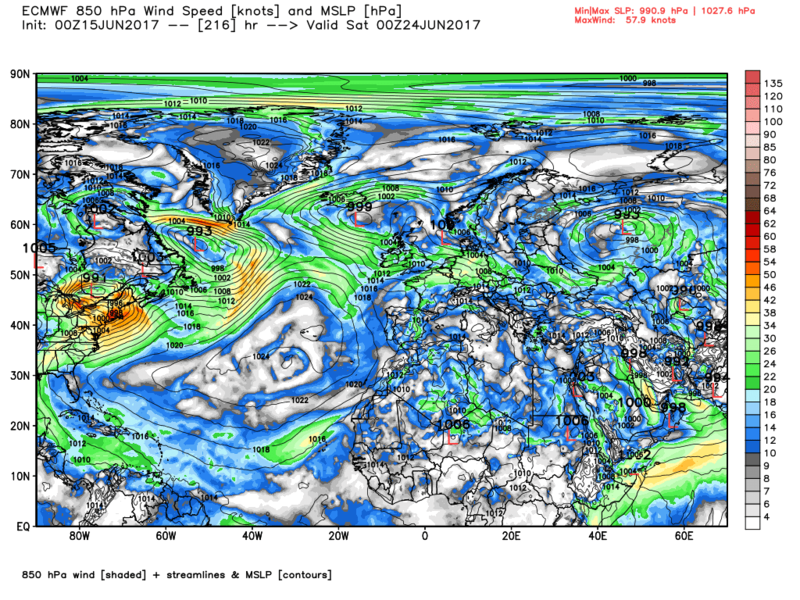 Remember the GFS is not a high res model. You want to be looking at them for a rough guide on temperatures. Also have to take into account Urban heat island effect, Heathrow is a prime example of this usually being 2-3 degrees warmer than anywhere else. It does look as though we are kicking summer 2017 off with a cracking start, we can't complain after the spring we just had. Given what we were looking at a week ago we have come a long way. The EPS 850mb mean and contours. 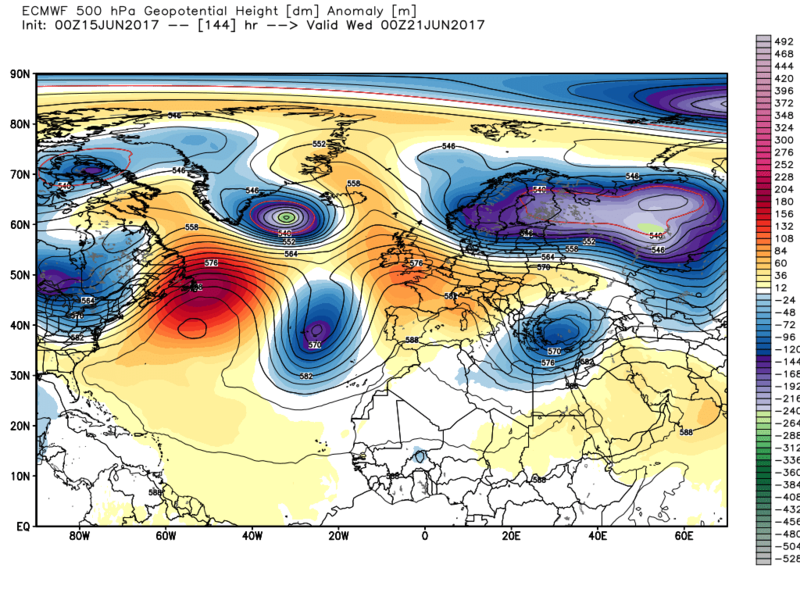 The question is, as already noted, whether the trough will track far enough east to affect the UK by the weekend The eps currently (operative word) is indicating that it may well with the flow veering south west. And of course even if it does it is not necessarily all doom and gloom. 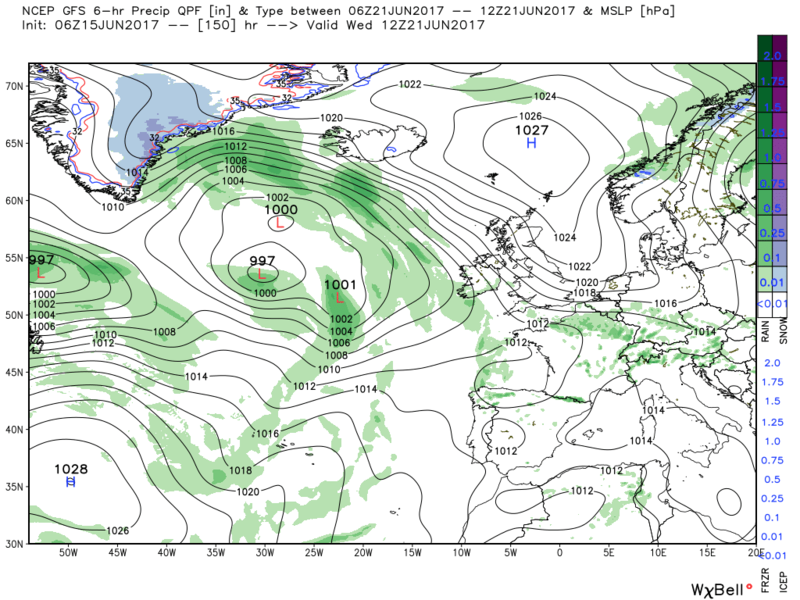 Laughably [GFS] is predicting 22/23c in places with 15c 850s. Yeah, ok then GFS! 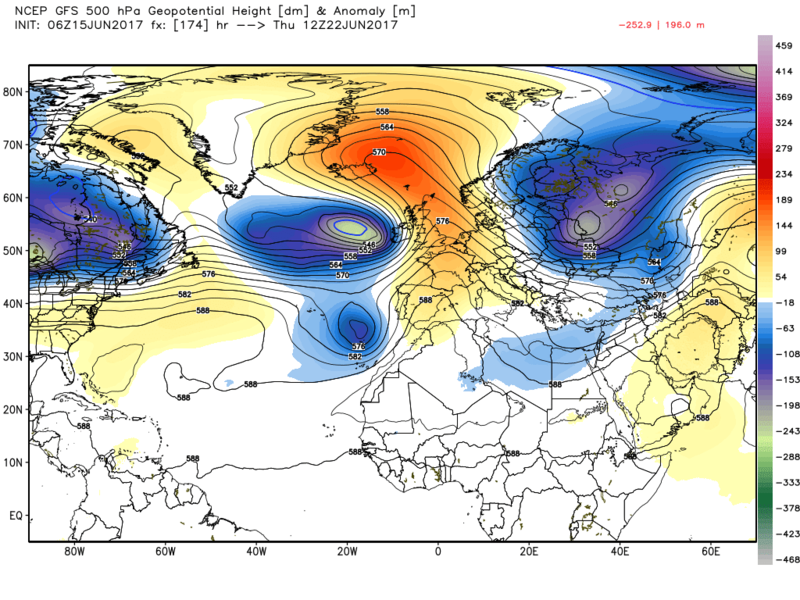 I'd say UKMO is a nice halfway house at +144 in that it has GFS' better alignment of lows and highs for persisting the settled conditions going forward, but ECM's less vigorous circulation around the high which would mean less inland extent of a cooler surface flow moderated by the N. Sea - this stronger flow being what leads to GFS predicting 22-23*C maximums for quite a few with 15*C 850s on Friday; although the isobars are aligned to bring a flow from the SE, the surface flow is more toward the E as a result of frictional effects with the sea and then land. The most widespread heat in summer occurs when a ridge becomes fairly weak in terms of SLP but with this being more to do with high temperatures (warmer air is less dense so less pressure from it at the surface) than the subsidence from aloft weakening - and that latter component can further intensify the heat via adiabatic warming (dry air warms as it sinks because the pressure rises as it does so and if you compress gases, there is more energy per unit space and so higher temps... oops I'm going a bit scientific lecture on you all!). In this light the ECM run is almost that 'pressure cooker' scenario, but it remains more aggressive with the Atlantic lows so doesn't quite get there - as I've said before this may be MJO-related, although forcing form that should be pretty weak and day 10 shows this with the upstream pattern looking ready to push a new ridge across the UK from the Azores days 11-14. I have been admiring the westward extent of the heat plume early next week - over halfway toward the Azores and over sea temps already widely over 1*C above the LTA. Could be some reinforcement of the SST anomaly pattern that already promotes such intense and extensive heat plumes... a positive feedback that could spell trouble for Europe this season. I hate to say it but it feels like 2017 is well placed to challenge 2003 in many respects. Hopefully Europeans have made adaptations since then that can reduce the health impacts. Next Thursday more and more being modelled as a very hot day in the southern half, possibly less so further north but doubts over that for me. The Brecon Beacons, can get very hot there under the right conditions. Hope for nice summer weather for your holiday, some good pubs down there. 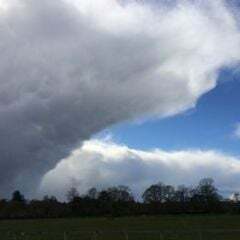 Yes, site boss Paul mentioned in his up and coming heatwave page that the initial warm air mass will invade Southern Britain from a more westerly source ( Ireland ). Will be interesting watching that heat plume develop out to the SW next week. Could produce up some amazing charts, hopefully. This is not the thread for it but as the subject of the European heatwave of 2003 has been broached with regard to the forthcoming possible heat wave some links to the aforementioned for anyone who is not familiar with the syn optics and impacts. Certainly the very dry weather contributed to the 2003 heatwave....it has been abnormally dry here in the UK through much of the spring, though I'm not sure about Western Europe as a whole. Spain has been blowtorch hot recently, with temps in the usual spots of Seville/Cordoba in the low to mid 40s. Whether this is leading to a repeat of 2003 conditions, or is just a short heat burst remains to be seen. It looks like remaining very hot for another week at least, before both the GFS and ECM sweep away the excess heat towards Italy. It'll be interesting to see, I don't think anyone thought this summer would be anything like a 2003 style heat fest (barring Nathan Rao & James Madden, but then again they think every summer will be this hot!). Will the weather catch everyone off guard again! ?